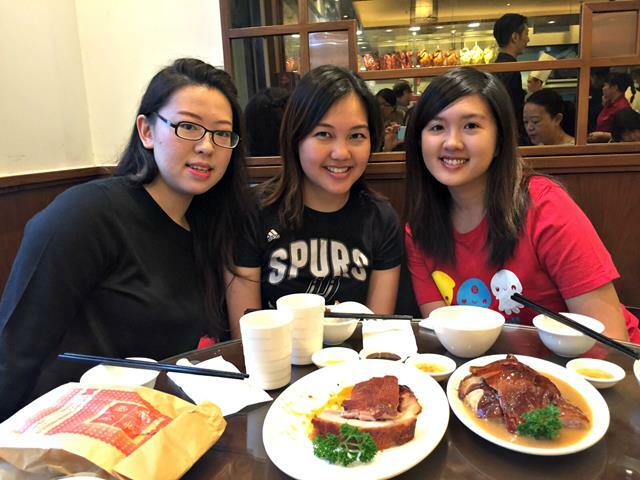 We spent our last day in HK doing (what else?) more eating, starting with Kam’s Roast Goose. Some of you might have heard of Yung Kee‘s famous roast goose. 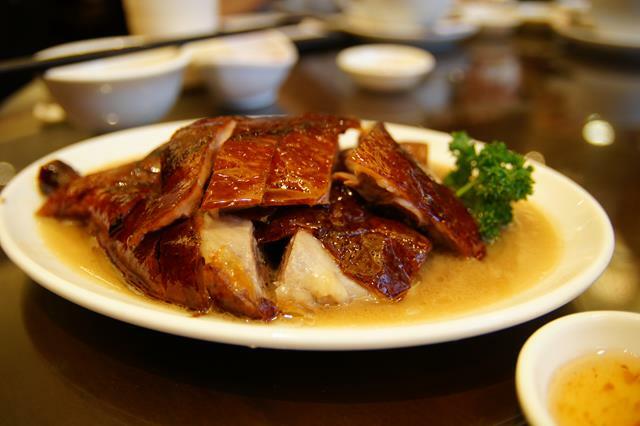 What you may not know is that due to a family feud, a grandson of the founder of Yung Kee has since started his own roast goose restaurant: Kam’s Roast Goose (226 Hennessy Road, Wan Chai), in competition with Yung Kee. 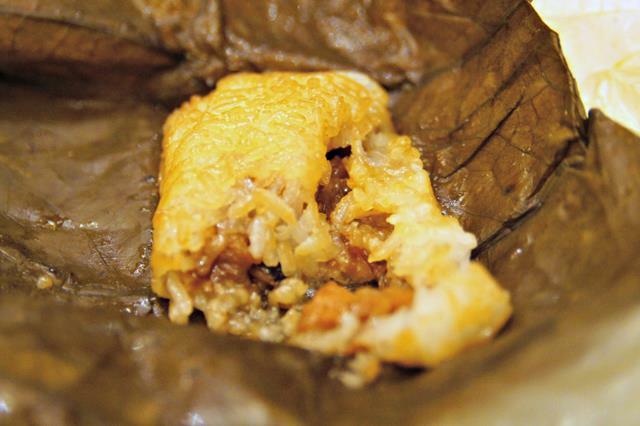 Since we had tried Yung Kee before, and since Kam’s was within walking distance of Ginny’s apartment, we decided to try Kam’s this time round. A word to the wise: get there in good time before it opens (11.30am) if you want to avoid a potentially long wait to get seated. We had aimed to arrive at about 11.10 / 11.15am, but ended up only reaching at about 11.25am. There were already over 20 people in the queue ahead of us, and the restaurant can only seat about 30 people. Fortunately for us, we managed to make it into the first seating. Those who had arrived a few moments after us weren’t so lucky! We had to share a table with another party, but that just meant that our hapless table-sharers couldn’t refuse when we asked them to help us take a picture. Unfortunately, they finished eating before we did and were replaced by a family whose kid kept spitting on the table and playing loud music on his iPhone.. so sharing a table is kind of a mixed bag. But more importantly, the food: we ordered century eggs (a nice appetiser), the signature roast goose, and a 3-meat dish of char siew, siew yok and suckling pig (basically various types of roast pork). As you would expect from a signature dish, the roast goose was exquisite. Less fatty than the one we had the day before on Lantau Island (although that was pretty good too), and came with a very nice sauce. From left to right: the char siew was full of delicious fats, the suckling pig was great, and the siew yok came with mustard (a nice touch), although it was a bit salty. We also went to Honolulu Cafe nearby (176-178 Hennessy Road) and picked up some egg tarts. They’re the flaky kind, and were nice and warm. Honolulu Cafe is also opening in Singapore, I understand, at Centrepoint. Yay, more egg tarts! 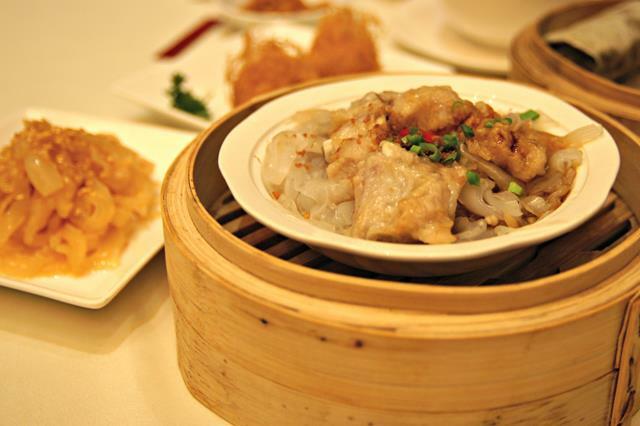 After some window shopping, we arrived at Lei Garden (the Wan Chai branch – 1/F, CNT Tower, 338 Hennessy Road, Wanchai) for a second lunch, because how can you go to HK and not have dim sum? 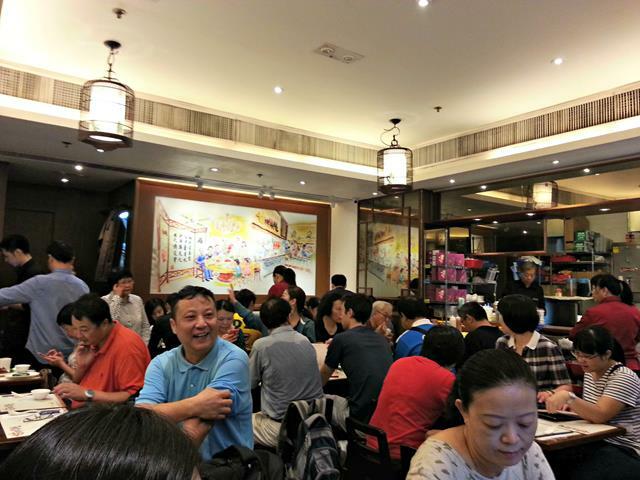 The first thing that struck me was the number of people chilling out in the restaurant, sipping tea long after they had finished their dim sum and reading their newspapers unhurriedly. 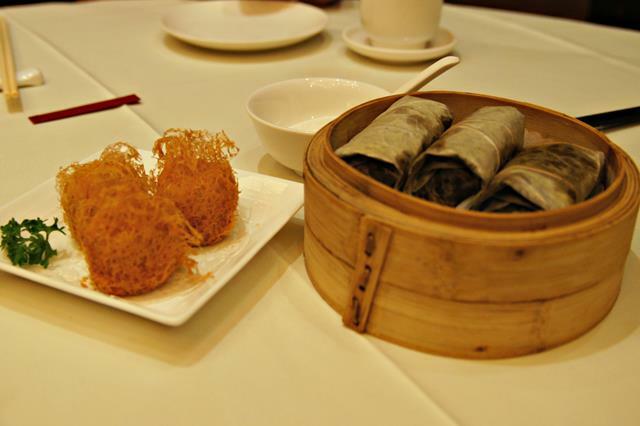 This is so different from how we eat dim sum in Singapore. 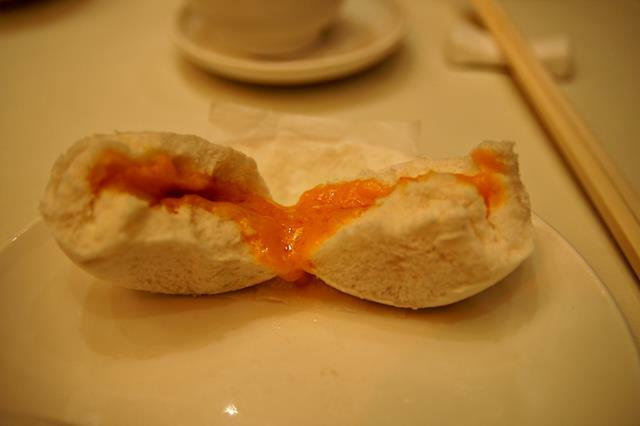 liu sha bao (molten salted egg yolk custard bun) – one of those things that I almost always order whenever I see it! It’s as sinful as it sounds. 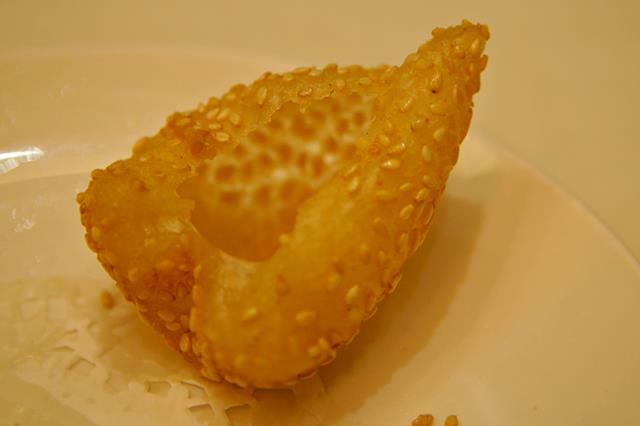 芝麻煎堆 (fried dough balls with sesame seeds) – we have something like this in Singapore but the dough here was much thinner and crispier. So addictive! If you’re thinking: that sounds like a lot of food for 3 girls to consume, you’re absolutely right! We ate until we simply couldn’t eat anymore and had to go back to the apartment to rest. The weather was conducive to napping as well – it had been raining the whole day, thanks to the T3. Adrienne and I actually got a little extra time in HK as our return flight back to Singapore was delayed due to the weather conditions. I decided to do a bit of last minute shopping, so I ventured out to Times Square at Causeway Bay with Ginny while Adrienne rested in the apartment. I ended up buying some loose leaf tea as gifts from the (rather posh) supermarket there. And somehow, we ended up buying yet more food! 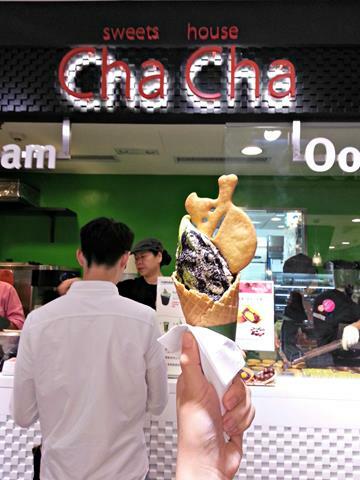 In our defense, it’s not every day that you see matcha ice cream combined with black sesame. This was some kind of Halloween special, and it was well worth it. We also grabbed some egg tarts to bring back to Singapore from Tai Cheong Bakery (a number of branches around HK, and opening in Singapore soon too!). Legend has it that the last British governor of HK was a fan of these. 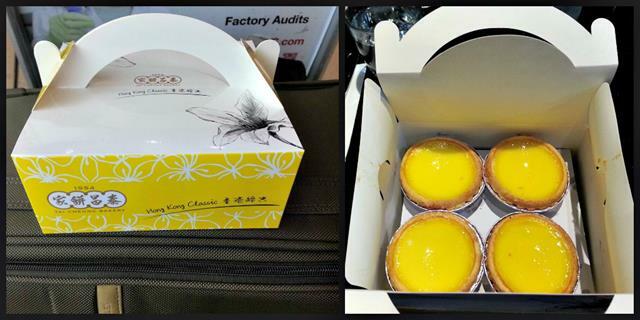 You can choose between Original (non-flaky) and Flaky egg tarts and can even mix the two in a single box of 8. 9 egg tarts cost me HKD49.50 – 1 box of 8 and 1 for the road (even after a day of pigging out), which is really very cheap. They were all gone within a day after I got home. In an appropriate ending to our typhoon-plagued stay in HK, our return flight got delayed even more after we reached the airport. Have you ever had to wait around for a flight which was delayed indefinitely? To pass the time, we had expensive but mediocre food while keeping an eagle eye on the departures board. Mineral water, a burger, fries and pasta set us back by about HKD400 which was way more than most of our other meals in HK. Eventually, our flight departed past midnight (having been originally scheduled for 6.45pm after the first delay) and landed just after 4am. That was a rough Monday – but an unforgettable end to an unforgettable trip! This post is part of The Weekly Postcard at As We Saw It – check out what’s going on elsewhere! It certainly all looks amazing. That fish! Thanks Corinne, it definitely was! slightly confused as to what fish you’re referring to though? Those photos of the first restaurant look so mouthwatering. I feel like I want to taste that pork crackling right now. I have never had goose. I would like to try that. thanks Ruth! 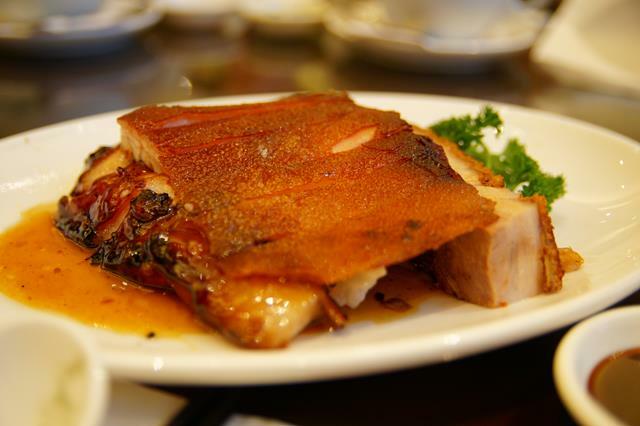 Crackling is exactly what that pork does in your mouth =D yeah i’ve never had goose outside of HK (I don’t care for foie gras) but it might be possinble to find them in some Chinatown somewhere. I’d have stopped at the roast goose – it looks that good. But then, I’ve always been a fan of duck and goose. Never had a century egg though. I had heard that Hong Kong is expensive but to hear that you paid the equivalent of US$50 at the airport? I can understand why you mentioned it. Anyway, thanks for sharing this on #TheWeeklyPostcard. It was a great read.